MD Anderson Dodge Charger SRT Hellcat Funny Car pilot Jack Beckman began race day seeking his first triumph at Houston Raceway Park. Against round one opponent Bob Tasca III, the driver of the ‘Best Appearing Car of the event’ experienced problems early into the run before slowing to a 5.321-second E.T. versus Tasca’s 3.949-second winning pass. 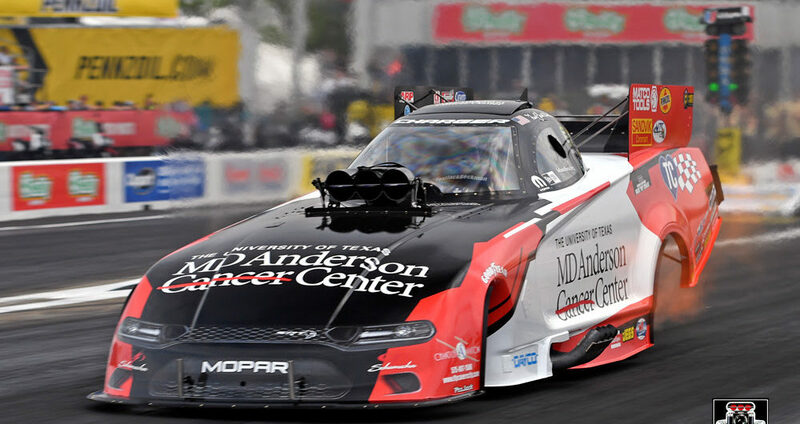 Despite the team’s early exit, they were still able to count the weekend as a win thanks to Doug Chandler, husband of the late Terry Chandler, who elected to banner MD Anderson Cancer Center on the side of Beckman’s Hellcat in honor of his wife. Before Sunday’s elimination rounds got underway, Beckman joined Chandler family representative Judy Pittman on-stage during NHRA’s pre-race ceremony where the duo presented a $100,000 donation check to Bobby Dean, Executive Director of Philanthropic Resources for MD Anderson, on behalf of Doug Chandler and his TLC Foundation. Before Sunday’s elimination rounds got underway, Jack Beckman joined Chandler family representative Judy Pittman on-stage during NHRA’s pre-race ceremony where the duo presented a $100,000 donation check to Bobby Dean, Executive Director of Philanthropic Resources for MD Anderson Cancer Center, on behalf of Doug Chandler and his TLC Foundation in honor of the late Terry Chandler.